Leeds castle is about an hour’s drive from Deal, but is well worth the effort. It is widely acknowledged as one of the most romantic castles in the country. As well as the beautiful moated castle with its sumptuous interiors there are over 500 acres of parkland including a maze. Other attractions include birds of prey and children’s adventure playgrounds. 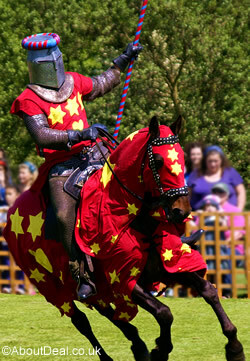 Throughout the year there are frequent events and displays including jousting and falconry displays. Additional activities on site for an additional charge and subject to availability: Go Ape, punting, Segway tours and falconry experiences. Visit the website for full details. This entry was posted on Friday, July 28th, 2017 at 12:15 pm	and is filed under Attractions, Tourism. You can leave a response, or trackback from your own site.